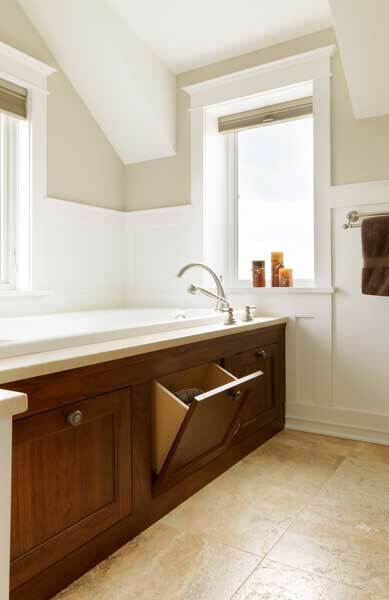 This custom solution works wonderfully for the client who wanted storage accessible to their bath without taking up additional floor space. After working with the homeowner, and contractor, our design team developed a clever solution in the tip-out cubbies which appear to be decorative panels when closed. These make great use of the space around the large tub, give access to items such as towels and bath toys for the kids, and don’t take up any important floor space in the room. By going custom this client was able to get exactly what they wanted for their needs – and a beautiful surround as well!